It had occurred to Sherrie and I that we had been to Asia a few times, but had never wandered around beautiful Colorado. For my upcoming birthday, we hatched a plan, have the grandparents take care of the midget, and run the buggy around our beautiful state. Destinations, the Great Sand Dune National Park, and the Royal Gorge. Our Plan; Head south to Alamosa, spend the night. Next day visit the sand dunes and go sand-boarding. 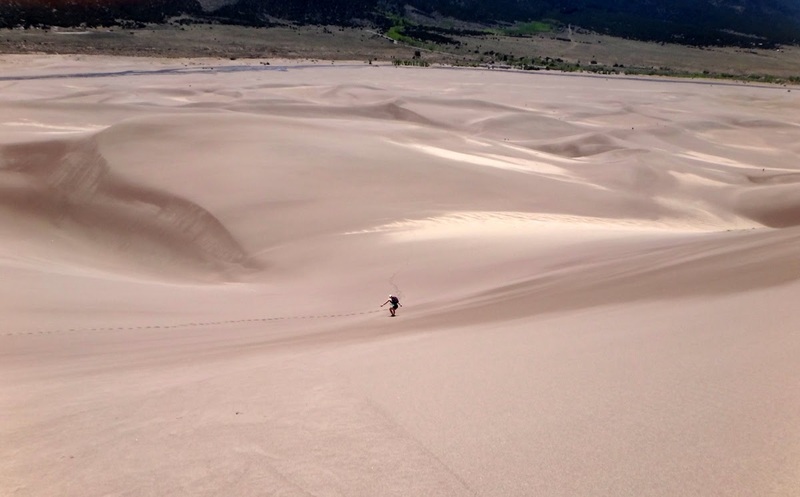 We’d hike the dunes and board, get dinner and spend another night in Alamosa. Then vector to the Royal Gorge. We’d spend one two nights in Alamosa, then one in Canon city. The drive to Alamosa was virtually equidistant heading southwest on 85 then east, or south on I25 and west to Alamosa. I25 is a featureless oversubscribed abomination, so we chose the much more scenic 85 route. It was an easy and beautiful 4.5 hour drive south past Fairplay to then east across the plains to Alamosa. As we crossed the plains near the towering Sangre de Cristo mountains, we were treated to a near brown out of dust storm sweeping across the highway. We arrived in Alamosa mid afternoon, and drove to a nearby park to stretch our legs. Alamosa seemed like a small friendly town. We checked into the Quality Inn in Alamosa, the best hotel available according to Yelp. The hotel was clean and quiet, and quite adequate for our sandboarding needs. We grabbed a fun dinner in a super-casual Mexican restaurant called the Monterrey Cafe. Our waiter was upbeat and we found out there is actually a college in Alamosa called Adams State University. Ok, we had until 6pm to get the boards back, it should be a problem given our day-at-the-dunes easy schedule. The boards were made of wood, with a plastic bottom and what looked like windsurfing footstraps on the deck. There were heel-cups that held feet into the board by what appeared to be surgical tubing. Odd, when renting the boards, we were handed two balls of wax. We wake up and follow the check-in-girls suggestion to find. Ef’s for breakfast. A charismatic latino guy greeted us warmly at the door. We were advised to get anything they had with green-chili. Wow! What a great breakfast. We tanked up on coffee and started the 45 minute drive toward the dunes. 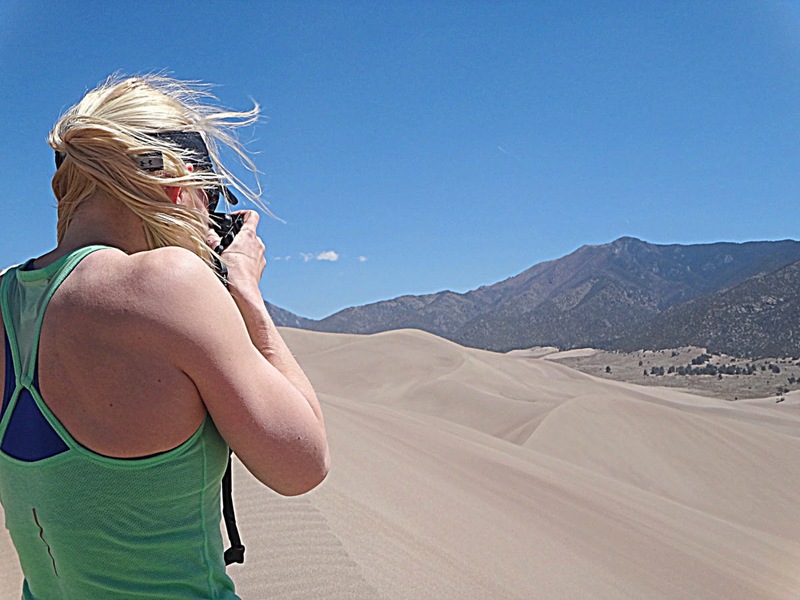 From a distance, the dunes appear small, mainly because they are backstopped by a number of 14,000+ foot peaks. We got to the dunes area and navigated toward one of the main parking lots. Sunscreen, hats, water, snacks secured, we hoisted our boards and started up the dunes. The weather was to be temperate, with highs in the low 80’s. The dunes were a bit odd in that when there was no breeze, the heat from the sand would rise. When the wind kicked up, the draft was coming down from the snow-covered peaks looming above. We were alternating between chilly and hot in 5 minute intervals. But hey, if we were looking for comfort, we wouldn’t be climbing sand dunes. The sand itself had a variable texture in 10 foot increments. 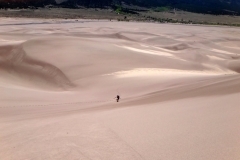 From bottomless sugar sand to hard pack and back seemed striped across the dune faces. The wind kicking up presented challenges. Most of the wind would drive clouds of sand from knee to waist high. The big gusts would push clouds of sand 20 feet or more above the sand, pelting us and making it hard to see. I was wearing a hat and spent a good chunk of the climb with a brim pulled down over the side of my face. After about an hours climb, we were at the top of the second highest dune. The sand was now blasting us so hard I was looking at my feet and pulling my hat as low as possible. Despite this, it was difficult to see and keep sand out of my eyes. In retrospect, some form of goggles would have been the call. Sherrie looked at me and said. I looked up. My best guess had it another 45 minute plus hike, directly into the wind and driving sand. We were fortunate to be at the dunes when the sane wasn’t brutally hot. There are many warnings around that in summer the surface of the sand can hit 150 degrees. This would have presented a difficulty, as I was having a hard time wedging my bare feet into the sand board footstraps , and there was no way I could have done it wearing shoes. We waxed our boards and set out cautiously. 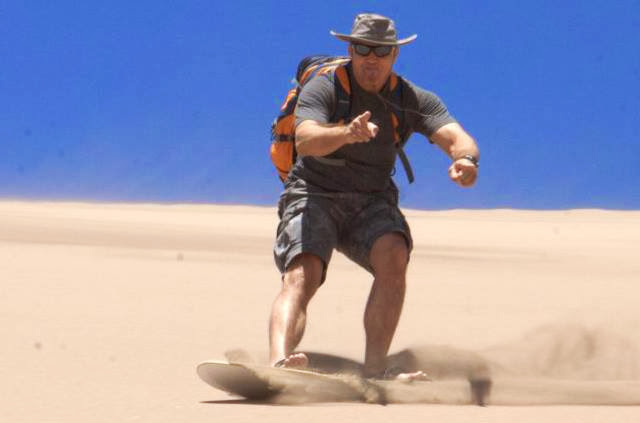 The good news: sand boarding is quite similar to snowboarding. The bad news. The wax lasts 50-75 yards, at which point the boards slow to a stop, or near stop despite being on seriously steep slopes. We boarded and hiked for another couple hours, then made the trek back to the car. On our way out, we decided to stop and make the short hike to the Zapata Falls. We parked, and took a 15 minute stroll up to a waterfall pouring into a cave. The waterfall was next to an ice fall as it entered the cave, and the water was CCCCCCOOOOLLD. We snapped a few pics and mulled our next move. From the cave, there was a ~7 mile round trip hike to the lake above which fed the waterfall. It was about 1:30pm and a 45 minute drive back to Alamosa to return our boards. The hike looked fun and steep over rough terrain. We made the decision to bail on the rest of the hike, as we would have been constantly trying to push the pace on already dune-hiked-tired legs. Instead we went back to Alamosa and tried to shower the sand out of everything. Sherrie and I caught “Iron man 3” then decided to head out to dinner. We were told a good steak dinner could be had at Hideaway steak house in the back of a bar. We found the unassuming place, and got a table in the nearly empty restaurant. The steak and service were good. We were however quite overdressed. I had on a polo shirt and jeans, and Sherrie had a nice dress. A tshirt, cargo shorts and flip flops would have been better suited. 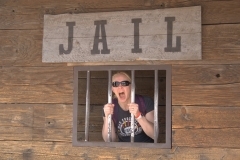 The next day we packed up and drove west to Pagosa springs and then northeast toward the Royal Gorge. What a difference in the climate between the open plains near Alamosa, and the lush area around Pagosa springs. Apparently being on the north side of the mountains made everything green and beautiful, a contrast to the sun and wind blown area around the dunes. We made it to the Royal Gorge around 11am. It was Memorial day weekend, and the place was packed and printing money. We bought tickets and headed across the highest suspension bridge in North America. Holy Crap! We got on the bridge which was 1000 feet above the water. There was a high wind whistling and giving slight motion to the structure. The little lizard in my brain was tilting. “You ok?” Sherrie asked as I was about 1/3 the way across. My gaze was fixed on the far side and I wasn’t looking much left or right. Odd, they let cars cross the bridge as well as pedestrians. The cards driving past shook the bridge more. Combine this with the howling wind, and I damn near ran across. We got to the other side and Sherrie managed to talk me into getting a horseback ride. I must have been shell shocked because I agreed. Anything that big, and that powerful which can go nonlinear if a candybar wrapper blows in front of it is not to be trusted in my book. I prefer things with a clutch and a throttle and my hands on them thank you very much. The guide laughed and went to get our horses. As our guide was adjusting my saddle, I realized the stirrups were about 18” long. The prior rider must have been a kid or a midget. Either way I felt bad for the horse while I was swinging a leg over. Every ascent my horse would complain and I’d pat his neck and sympathize. Sherrie’s horse seemed to want to go walkabout, and preferred to follow any other riders we encountered. We managed to survive the 30 minutes and my horse and I were equally happy to part company. The walk across the bridge back had little wind, and I was MUCH better with being on it and hanging out for pictures. Sherrie and I had purchased tickets to the zip line across a section of the Gorge. This seemed like a good idea until I got near, and the lizard in my brain flat out tilted. I opt’d out. I should have gone back, but after the initial bridge freak out, I couldn’t get my head around it. We packed up and headed for our night in Canon City. We were staying at the Comfort Inn. We drove through Canon City, with main street being a block off the through highway. As always, we asked the hotel check-in people where was good to eat in town. “Well if you want the most popular restaurant, it’s right there” She pointed across the parking lot at a Chilis. Another guy mentioned “Pizza madness” and a brewing company. It was a bit early, so we grabbed our running shoes and drove to a park in town. We ran an easy pace for about 5k, then decided to see main street. The good news: Parking was easy to come by. We walked by Pizza Madness and it had a good crowed and what looked to be a good menu. We drove back to the hotel, showered and headed to pizza. We were starving. The food was great. Stuffed, we tried to find a venue to watch the UFC fights . The local sports bar advertised them, but upon sticking our heads in, did not carry them. “We just couldn’t break even” a friendly bartender informed us. Looking around at the almost completely empty bar, that seemed a reasonable statement. We went back to our hotel, had a few drinks and went to bed. The next day, we drove the 45ish minutes to Colorado Springs, then made our way back home. 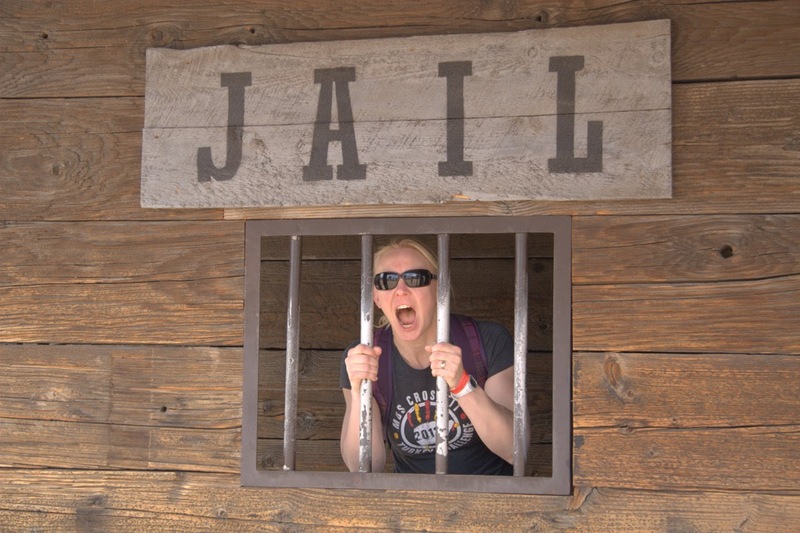 According to Wikipedia, Canon city’s claim to fame is housing 16 prisons of various severities. Super. Kind of explains the pervading eery vibe. Colorado is awesome, and I can’t believe it took us this long to tour it. There’s a lot more to the state, and we are planning on seeing it. We should have brought goggles to the dunes. I should have done the zip-line. I may have missed my opportunity for the near future. Within a few weeks of our trip, the entire area caught fire burning all structures in the area. We saw an aerial view on the news, and it appeared as if everything but the bridge itself was destroyed. Staying in Cannon city should have been avoided. It would have been much better to stay in Colorado Springs and have driven to the Gorge.